You see those silly stickers, the white ovals with the black writing, all over the place. There is a marathon one, simply saying 26.2. I mocked up this 25.6 one, which is a common size for a bottle of beer. It is also the amount of ounces in a fifth, or fifth of a gallon. This was a common size for liquor in the United States, until regulations changed it over to metric fifths; 750 milliliter bottles, which are 7 ml smaller. Beer is not subject to the same sort of regulations as distilled alcohol, which is perhaps why breweries occasionally make fifths of beer. Between this and pints, beer has retained much of the English system of measurement. 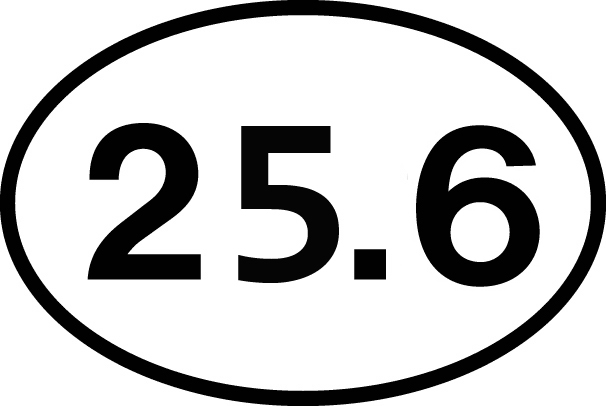 One day the world will be fully metric and my proposed 25.6 sticker will be a quaint bit of nostalgia.